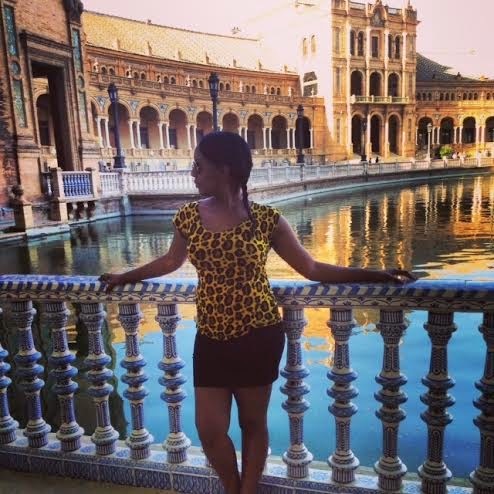 At the beginning of this month I visited the beautiful and picturesque city of Seville in Spain. I wasn't sure what to expect from Seville, my imagination told me it would be quiet and quaint full of little traditional villages. The reality was quite different. The only way I can describe it is as...stunning. I went to many fascinating and buzzing cities around the world in my past life as a Virgin Atlantic Flight Attendant, but since my last 'working' flight 10 years ago, I have started to explore Europe more and more. I think bar Paris, Seville has to be up there as my favourite European city. Everywhere you looked was a snapshot moment. 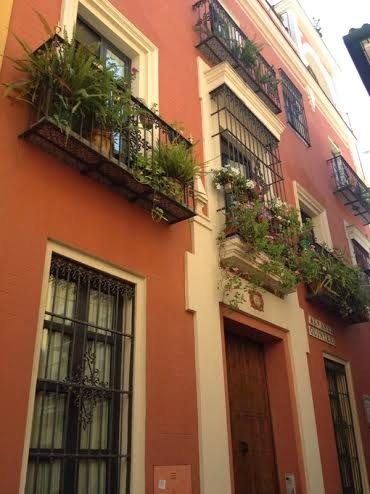 There was narrow cobbled streets with pastel coloured apartments displaying vibrant, fabulous window boxes from their balconies (below). There were streets lined with trees full of the famous Seville Oranges which are traditionally used for making marmalade as it is very bitter in its natural state. 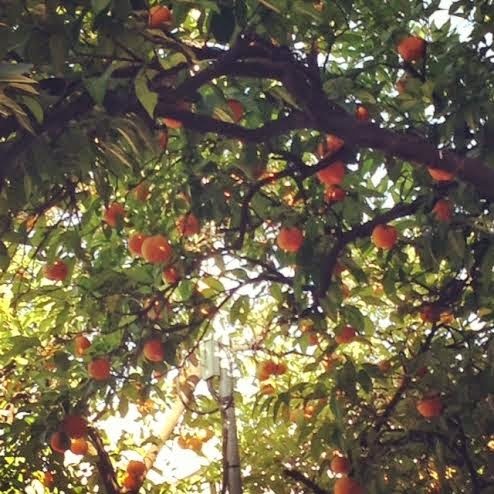 It was so beautiful to look up into the trees and see bright orange balls of fruit-something you definitely don't see every day in colder climes! 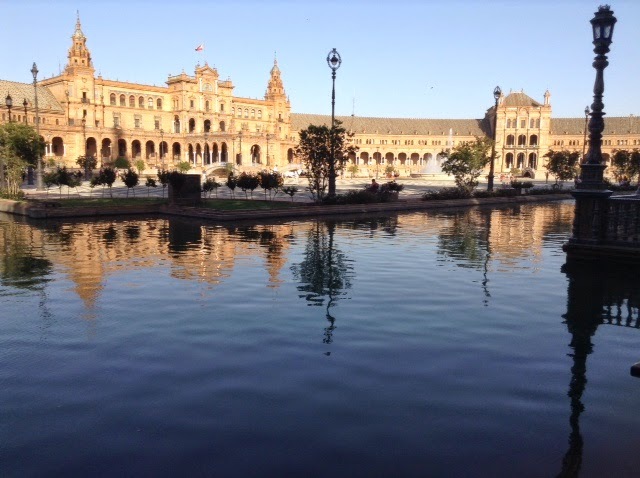 There is the truly spectacular 'Plaza de Espana' which is a semi-circular brick building, with a tower at either end sat on a canal crossed by four bridges. I did the very touristy thing of renting a small boat and rowing under the four bridges-it is such a gorgeous place and there is so much ornate detail in the architecture of the buildings that you could easily spend hours there just soaking it all in (below). I was there until sunset and the image of the sun setting behind this idyllic view is something that will stay with me for a long time. The Seville Cathedral is the cities main draw and even if you are not of the catholic faith it is still a jaw dropping and moving sight to hold. It is the third largest church in the world! It was extremely busy with large organised tours but the inside is so vast that it can accommodate everybody. There were a few people sat crossed legged on the floor, with drawing pads and watercolours, hoping to capture the images in print. I took many photo's but they really do not do the cathedral justice, as the many gothic carved scenes were just so intricate and ornate that they have to be seen with the naked eye to be appreciated. If you ever go to Seville, this is a must-see. 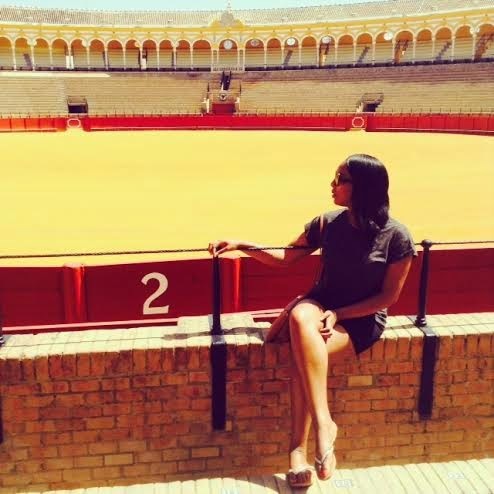 The Plaza de Toros de la Real Maestranza de Caballeria de Sevilla. There was no bullfighting scheduled on that day (thankfully, as although it is a huge Spanish tradition, I am not sure how I would feel about seeing a live bullfight in action) but I did pay to have a guided tour at it really was fascinating learning all about the history and the techniques that the Matadors have to learn to be successful and ultimately, revered by the locals. The food was lovely too. I love trying local delicacies and of course it was Tapas everywhere. As soon as you sit down in any restaurant or bar you are presented with olives and these tiny breadsticks that are just so 'moorish'! I don't think I actually had a full meal anywhere! It was just lots of different portions of different dishes on my plate but all so authentic and delicious. One thing I just loved but is a bit naughty (oh well, I was on holiday!) 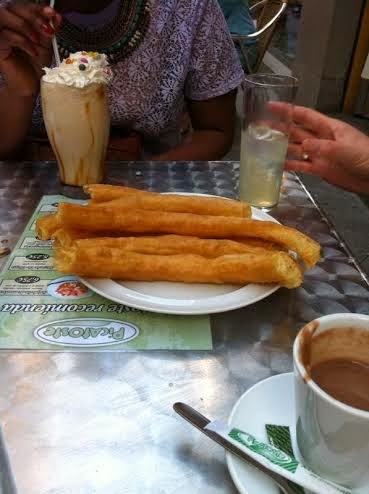 was Churros, a type of Spanish doughnut which is dipped in hot chocolate-amazing! (below)....I've also got a Rum and Raisin Ice Cream smoothie in this picture!!! Lastly, I'll leave you with a few tips when travelling. The first suitcase I ever brought was a Samsonite hard shell case. I brought it in 2002 for my first longhaul trip to Los Angeles and it is still going strong 12 years later! This case has been flung around by many baggage handlers around the world as it was the case I used for work. It was an investment as it cost around £150, but I needed a case that would stand the test of time and it sure has. It has even withstood being melted as one night I left it front of the gas fireplace...the smell of burning plastic soon woke me up from my jet lagged state (and the fact that I could have burned the house down!) so it now has a little melted corner as a memento! For cheaper options, Primark do a really good range of trendy suitcases. I brought a case from here a few years ago in a lovely 'Laura Ashley' esque style....It's so easy to spot as it comes down the baggage belt and I don't think they made many of them as I have hardly seen anyone else with this case which is a bonus! (below). Also, try and buy a case with a separate zipped area inside- it is perfect for storing shoes. 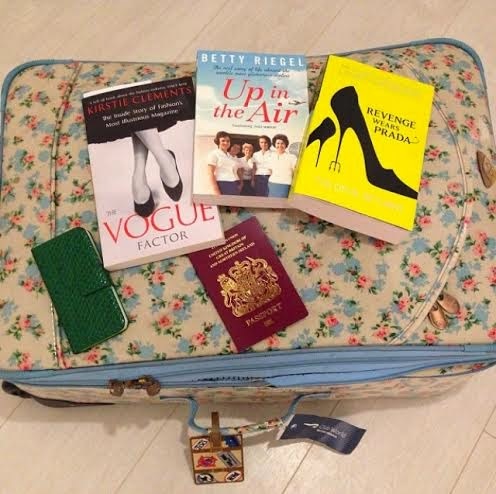 My Primark case with essential reading material! Always take some extra carrier bags in your suitcase. You'll be so glad you did. They are perfect for putting dirty laundry in so you don't have to mix them with your clean clothes...and you also don't have to worry that your unwashed smalls may appear on that baggage belt at Heathrow trailing behind your broken suitcase! They are also great for packing wet items like swimsuits, towels, wash rags and toothbrushes- stops your clothes from smelling damp. I also like to put all of my hair products into plastic bags as then I don't have to worry about leakage spoiling any of my travel wash bags. If you are checking a suitcase in, then travel light on the plane. Make sure you have all your essentials for the flight like passport, e-ticket etc. Some people use a travel wallet but I have always just used the inside pocket of a large bag. That way it's all secured and in one place together. Make sure you have a couple of magazines to keep you going...I always bring a book on my flight but find it so hard to switch off and get into it that I always just end up skimming through a 'Hello' or 'OK' magazine...I love people watching and there's too many distractions on a flight! Also, always pack a spare pair of knickers in your hand luggage...you never know if your bag is going to make it to the same destination as you at the same time!! That's it from me today, let me know if you've got any other tips to share.